Worthing Thunder picked up their second piece of silverware in nine months after an 84-80 triumph over Loughborough Riders in the final of the National Trophy at the University of East London. After briefly holding the lead in the first minute, it was Loughborough who sought to stamp their authority on the match after recovering and holding the lead for virtually the remainder of the match. At the end of the first quarter the Riders were ahead by seven points. In the second period following an 8-0 run Loughborough extended their lead to double digits but settled for a nine point advantage by the half-time break. But Thunder pulled away late on to be crowned National Trophy champions. Jorge Ebanks was awarded MVP for his performance in scoring 20 points, five rebounds and the same number assists. Worthing's other scorers were Zaire Taylor (19), Alex Owumi (15), Kevin Moyo and Brendan Okoronkwo (11), Josh Goddard (five) and Tom Ward (three). Speaking following Thunder's win in the final, Ebanks said: "It feels great to be named MVP. It was not my goal coming into the game, I just wanted to see Thunder win. "I was fortunate that I played really well and I am happy with that. We have a lot of firepower on offence – too many people and too many weapons to guard against at one time. So long as we stuck together – and we did – it was going to be tough to beat us." Whatever was said in the dressing room at the halfway stage seemed to galvanise Thunder into action. 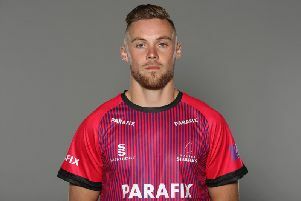 Perhaps it was the arrival of Tom Ward who had just flown in from California and having missed the first half rushed around the M25 to join his team-mates - or perhaps it was Thunder’s never-say-die attitude they have displayed so often this season. Within a minute of the restart Thunder had reduced the lead to four points and although Loughborough continued to maintain their lead, this was a game that Thunder never let get out of reach. Ward’s first action on court was to hit a valuable three-pointer from outside the arc to the delight of Thunder’s large and enthusiastic supporters. The momentum was shifting. By the end of the third quarter Riders were still hanging on to a four-point lead but Thunder’s confidence was growing. Loughborough were starting to get into foul trouble and Jorge Ebanks was having an increasingly influential effect on the, it was Thunder who were beginning to take control of the game. Eventually Worthing managed to claw their way back into the game with some aggressive rebounding under their own boards and some spectacular baskets from Zaire Taylor and Kevin Moyo who hit three-out-of three three pointers in the game. It was with just two minutes and 45 seconds remaining of the match that Thunder crept into the lead (79-77) – the first time since the very early minutes of the match. Wise heads and the experience of Thunders’ senior players then took control. Further baskets from Taylor, Okoronkwo and Ebanks down the stretch saw Thunder home to a thrilling victory in front of their jubilant fans.